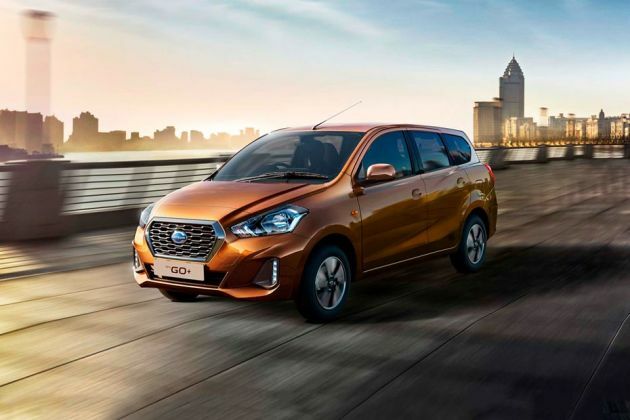 Datsun India has launched its much awaited multi purpose vehicle, Datsun GO Plus in the car market at an affordable price range. Its compact size makes it easy to maneuver on the city roads and this a big advantage. This model series is being sold in four trim levels, among which, Datsun GO Plus A is a mid range variant. It is equipped with a 1.2-litre petrol engine, which comes with a displacement capacity of 1198cc. This power plant is coupled with a five speed manual transmission gear box, which helps in delivering an impressive performance. The company has given this vehicle an attractive exterior look along with spacious internal cabin, which can easily take in seven passengers. It is designed with a large wheelbase of 2450mm along with a decent ground clearance. Its overall length measures about 3995mm along with a decent width of 1675mm and a total height of 1490mm, which is rather good for providing enough head room. The exteriors of this compact multi purpose vehicle is designed with a neatly crafted headlight cluster, which is incorporated with halogen lamps and side turn indicator, an attractive radiator grille, a body colored bumper and so on. At the same time, its internal section has a lot of sophisticated aspects along with good seating arrangement, which gives the occupants a comfortable driving experience. The company has given this compact MPV a decent external appearance and it is fitted with a number of styling aspects. To begin with the frontage, it is designed with a black perforated radiator grille with a lot of chrome treatment. It is embedded with a prominent company insignia in the center. This grille is surrounded by a well-lit headlight cluster, which is powered by halogen lamps and side turn indicator. There are a couple of visible character lines on the bonnet, which creates a distinct look. Just below this, it has a body colored bumper, which houses a large air dam of cooling the engine. The windscreen is accompanied by a set of speed sensitive wipers, which has intermittent and drop wipe function. It has neatly crafted wheel arches, which are fitted with a sturdy set of 13-inch steel wheels. These rims are further covered with 155/70 R13 sized tubeless radial tyres. Coming to its rear end, it has a curvy boot lid, which is embossed with variant badging and body colored strip. Apart from these, it also has a radiant tail lamp cluster with reverse light and turn indicator and a body colored bumper with a pair of reflectors. Its large windscreen is made of green tinted glass and it fitted with wiper and high mounted stop lamp. The manufacturer has given this Datsun GO Plus A variant a decent looking internal section, which is incorporated with a number of features. In terms of seating, it is equipped with ergonomically designed seats, which are covered with premium upholstery. Its front seat is connected, while second row seat comes with tumble down and third row has bench function that helps in increasing the boot volume. These seats also have head restraints and it offers ample leg space for all passengers. The car maker has given this vehicle a number of utility based aspects, which includes cup and bottle holders, map pockets in all doors, rear parcel shelf, assist grip in second row, front door armrest, interior room lamp and many other such aspects. Its smooth dual tone dashboard is equipped with quite a few aspects like collapsible AC vents with silver finish, a voluminous glove box, a three spoke steering wheel and an instrument cluster with various functions. It also has ergonomically located parking brake and gear shift lever for convenience of its driver. This variant is fitted with a 1.2-litre, in-line petrol engine, under the bonnet, which comes with a displacement capacity of 1198cc. It is integrated with three cylinders and twelve valves using double overhead camshaft based valve configuration. This engine is incorporated with an advanced electronic gasoline injection fuel supply system, which helps it in delivering a decent mileage. Under standard traffic conditions on the bigger roads, it gives out 20.6 Kmpl, while within the city it has the ability to return about 16 Kmpl. This petrol motor has the capacity of churning out a maximum power of 67bhp at 5000rpm in combination with a peak torque output of 104Nm at 4000rpm. It is skilfully coupled with a five speed manual transmission gear box, which has hydraulic clutch operation system. It sends the engine power to its front wheels. It allows the MPV to accelerate from zero to 100 Kmph in 15 to 16 seconds. At the same time, it can attain a maximum speed in the range of 150 to 160 Kmph. This Datsun GO Plus A trim has an efficient braking as well as reliable suspension mechanism, which keeps it well balanced at all times. Its front axle is assembled with a McPherson strut, which has double pivot lower arm, while rear one is fitted with H-type torsion beam mechanism. On the other hand, its front wheels are equipped with a set of ventilated disc brakes and its rear wheels have been fitted with a conventional set of drum brakes. Its responsive power steering system is tilt adjustable and supports a minimum turning radius of 4.6 meters, which is rather good. The list of features include an efficient air conditioning unit, which comes with a heater and a blower, a mobile docking station including amplifier, mobile holder, Aux-in and USB port, gear shift guide, follow me home headlamps and so on. It is bestowed with an advanced instrument panel for keeping the driver updated. Apart from these, it also has all four power windows the driver side auto down function, remote fuel lid opener, trip meter, digital tachometer and many more. The car manufacturer has blessed this multi purpose vehicle with a lot of protective aspects, which are 3-point ELR seat belts with center lap belt, rear doors with child locking system, headlamp leveling device, an advanced engine immobilizer for preventing it from theft, central locking system and many other such aspects for a stress free driving experience. 1. Cost of maintenance and spare parts are quite affordable. 2. Engine performance and fuel economy is satisfying. 1. Absence of CD player is a minus point. Datsun GO Plus is available in 5 different colours - White, Sun Stone Brown, Ruby Red, Crystal Silver, Bronze Grey.